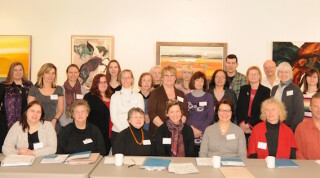 So who would have thought that the Latvian National Federation in Canada Latvian School Teachers’ Seminar held in Toronto this February – primarily for schools of third-generation Latvian immigrant children – could still get emotionally stuck in the language versus culture debate? Fortunately seminar participants were able to come together to embrace new teaching methods and tools. So much has changed since Latvian diaspora schools opened their doors 70 years ago. Third-generation immigrant children have a wider scope of activities – hockey, dance and skiing are reasons to skip class. Latvia is accessible. We have the Internet. And most diaspora Latvian kids don’t speak, read or understand Latvian. Nor do their parents. Elita Petersone, Education Chair of the LNAK (Latvian National Federation in Canada), kicked off the one-day seminar with findings from a spring 2014 survey of Canadian Latvian schools. Daina Gross, PBLA Education Council member from Australia, touched on findings from another survey, which she presented at the PBLA (World Federation of Free Latvians) Diaspora Conference in Riga in October 2014. The survey of Latvian school graduates found that the majority of 300 respondents valued Latvian school experiences primarily for geography, history and friendship-building, while language took second place. Respondents also said family and community were more important than schools for building awareness. There are currently 100 Latvian “weekend” schools outside of Latvia (Europe (70), USA (19), Canada (6), Australia (6)). Many of the schools operate every other week; some are not held in Latvian. 26 of the schools in Europe were founded after 2012. Conversely, all the diaspora schools in Australia and North America were founded in the 1950’s (there were 70 Latvian schools in the USA in the 1960’s). About 2,000 kids attend weekend schools worldwide (Europe (1,200), North America (650), Australia (150)). In Europe only about 10% of recent emigre children attend Latvian schools. The number of kids per school ranges from six in Würzburg, Germany to 50 in Reykjavik and Stockholm. For some, the stats are a downer. “We’re worried about what’s happening to the Latvian language,” said one teacher at the Toronto seminar. For others they’re just reality and language loss is not considered a deterrent. “Anyone can be an ambassador to Latvia,” said one teacher. I initially heard about these facts and figures back in the fall when our Toronto Latvian School Valodina had sunk to an all-time low. We had no principal, no desire to really be there anymore, and what do you do with a tiny school that’s shrunk to 11 students? Daina Gross’ stats provided a group of parents with a much-needed kick-start. Compared to six kids, Valodina’s group of 11 didn’t seem so tiny anymore. Europe was blossoming with new weekend Latvian schools. If Valodina’s current model wasn’t working, why not change it? Some parents even considered renaming the school “Valodina 2.0,” except that Valodina was founded on the principle of change, which the group had obviously lost sight of. Four months later, Valodina’s head count is up from 11 to 14, feedback is enthusastic, and the team of parents is considering ways to reach other kids in the community who might appreciate the Valodina model. Proponents of standardized Latvian language tests (absolutely necessary when language levels are so extreme, said Andra Zommere, Head of the Schools Sector of the American Latvian Association). A school that meets on an ad hoc basis only if everyone wants to. A school built on the vision that culture can only grow from language. A school developing around Latvian-as-a-Second-Language needs. What’s going on around the world is relevant to everyone. Daina Gross’ presentation reiterated that change is global and that we can learn from one another. There’s an increasing number of resources available from Latvia on the Internet. Many schools are dealing with the same issues – we need to share resources and stories. Teaching LSL (Latvian as a Second Language) makes sense when Latvian is a second language. Aija Mazsile is a Toronto teacher with 20 years experience teaching ESL (English as a Second Language). Mazsile’s ESL bag of tricks is great for teaching Latvian, which is something Latvian teachers who aren’t in the LSL-reality-headspace might consider getting acquainted with. Inquiry-based learning is the key to engagement. There’s more to teaching than books. Tech-guru Arnis Gross from Australia rounded out the day with a presentation of apps, iPad miracles and various Internet sites, such as Maci un macies that bring learning into the 21st century. Classes are now held every other Friday and start half-an-hour later. That’s a big change from the way Valodina has operated for 37 years, but it gives everyone an extra 30 minutes to make it through Friday-night traffic, and removes the stress of having to make the weekly trip. An engaging group workshop is held at the beginning of each evening. With just over a dozen kids, activities can still begin even if a few students are missing. Workshops always have new themes, are run by guests (preferably Valodina grads), and aim to inspire. Kids have painted Latvian symbols on mugs, learned to play Novuss, and built model Latvian homesteads. In a few weeks Valodina will be running Iron Chef: Pirags. Kids are split into classes by age, not language ability. Valodina doesn’t have enough kids to separate by age anymore, and history and geography can easily be taught in English. In addition, kids need the opportunity to develop friendships independent of their language abilities; speakers and non-speakers have been segregated for too long. Valodina really makes use of social media. Valodina’s Vardi un burti blog functions as the school journal. The school also has a Facebook page, a Twitter account, and key info is posted on the Latvian Canadian Cultural Centre’s site.